Packing lunch for kids is the most hectic job, especially when you have picky eaters it gets even more difficult to pack lunch that your kid will eat. Every day moms are struggling with ways to Jazz up the lunch box so that it doesn’t come back home, full (not eaten). 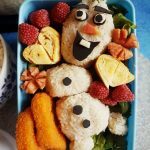 As part of the series on the blog Fun, Creative and Delicious Rice Recipes, I took the challenge to come up with a creative yet delicious lunch option for kids and here it is OlafLunch box. Japanese Bento-lunch box have always fascinated me and I so wanted to try making it. With this series I got that opportunity and it was so much fun doing it. 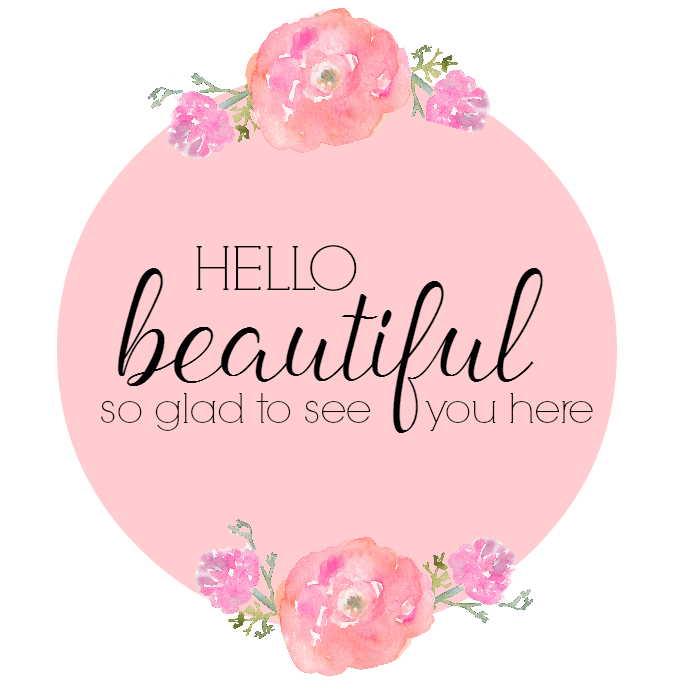 Learning new techniques and methods of cooking or doing things makes you feel so good. In a Japanese Bento Box you pack different into items in a compartmentalized box. This way you get variety of food options in a box. Lunch box doesn’t always have to be sandwich, it can be rice too. And when it’s your kid’s favorite character, lunch gets even more exciting. Movie Frozen is the most loved movies of all. While all the characters are a favorite, Olaf is a loved a little more. 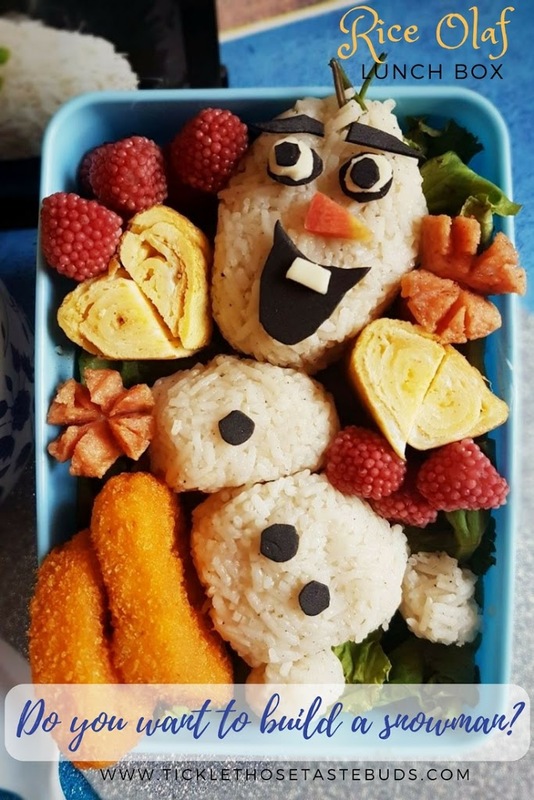 At first I was a bit nervous in making the Olaf thinking it won’t turn out perfect but with Reem ka Steam BasmatiRice it was so easy. This long grain, fragrant rice is so easy to cook and was even easier to handle while making Olaf. It was a moment of achievement when the rice Olaf turned out perfect. The rice was flavored using chicken broth so that it tastes good. The omelet hearts, sausage snowflakes, chicken nuggets and berries complete the box. 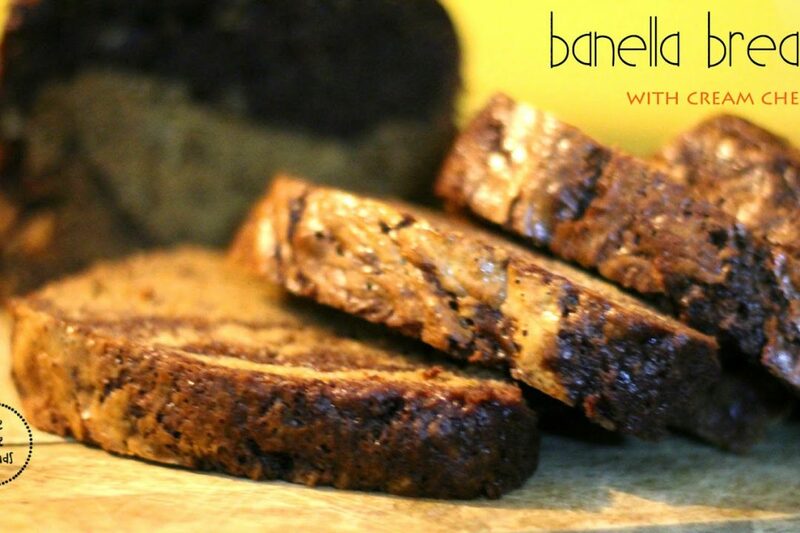 All ingredients were from the kitchen pantry. 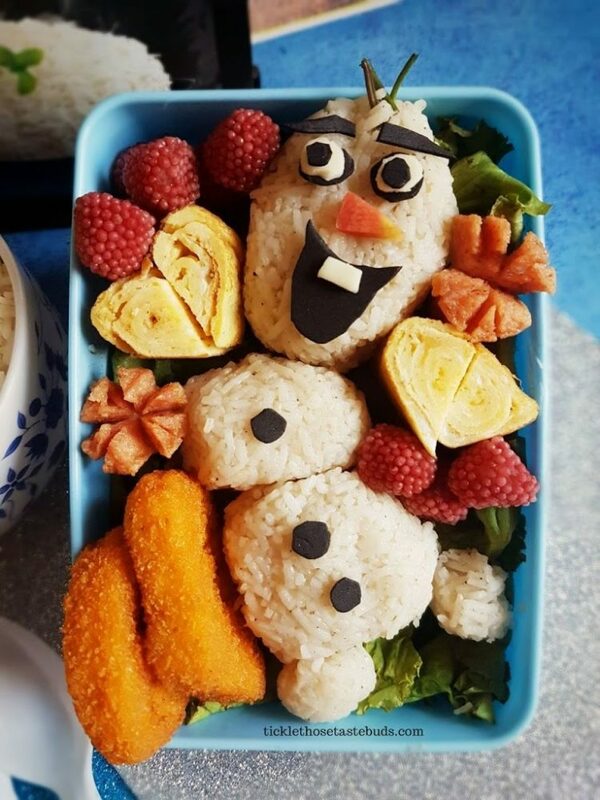 The face details of Olaf were supposed to be made with Sushi Nori Sheets but I didn’t have them so used paper instead, to complete the look (don’t add paper to the lunch box – this was for photography purpose only). 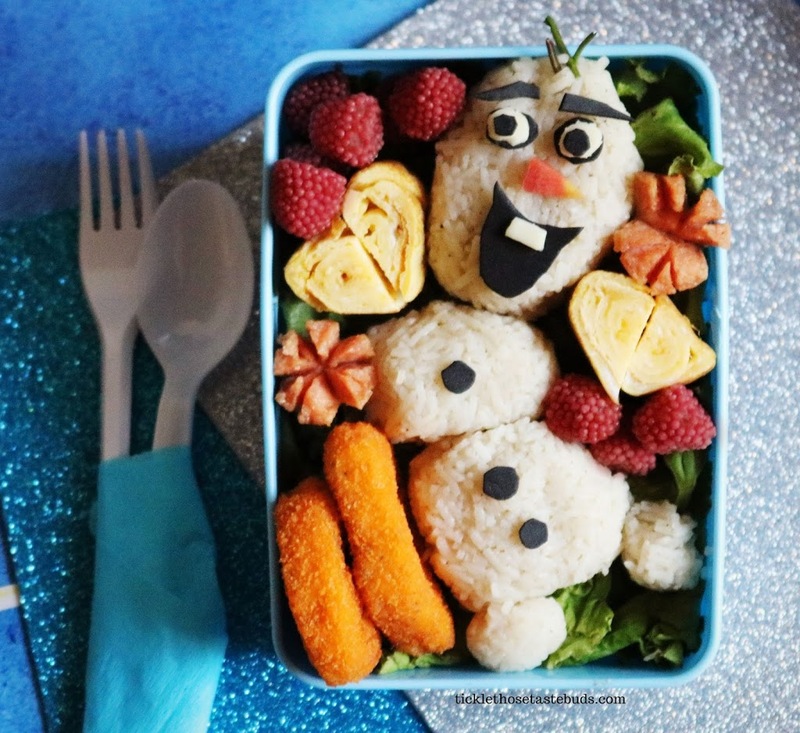 This Olaf Lunch box is sure to put smile on faces and kids would finish the box for sure. 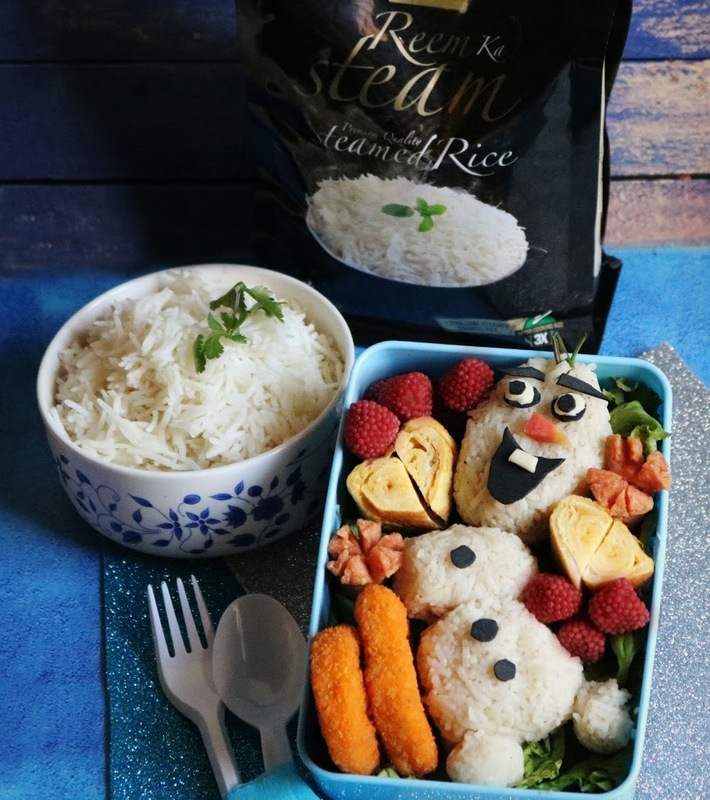 Jazz-up the lunch box, make rice Olaf, bear or any of the favorite character using Reemka Steam Rice and keep your kids fueled all day with creative and nutritious meal. Cook Reem ka Steam Rice according to package instruction. Let it cool, best to prepare a day in advance. Using a plastic wrap shape the rice to make the body of Olaf. Cut small circles out of sushi nori sheet to make Olaf’s eyes, buttons, brows and mouth. Cut circles of sliced cheese for eyes and a thin strip for teeth. Attach them on the face using little mayonnaise to make it stick together. Use the carrot to make the nose. Heart Shape Egg Omelet: Beat eggs and season with salt and pepper. Heat oil in a pan on low heat. Pour 1/5th of the egg mixture in the pan and spread. Cook the egg until the edges start to turn, start rolling the egg. Move the rolled egg to one side of the pan. Pour another 1/5th of the mixture, spread. Lift the rolled egg a little to spread the mixture under it. When the edges start to turn roll the egg again. Repeat until all the egg mixture is consumed. Now cut the egg into one-inch pieces. Place the cut side up (the side where you see the egg swirls) Cut diagonally and then turn one of them upside down. Attach to make the heart shaped egg omelet. Cut Sausages in half. Make cross incision on it and then make another incision on it. Pan fry the sausage, the snowflakes pattern will begin to open. Place Salad leaves on the base of the box. Position Olaf, fill up the spaces with Heart-shaped Egg Omelet, Sausage snowflakes, berries and nuggets. This is absolutely adorable and maybe too cute to eat! 🙂 I love it and I'm sure kids would too. 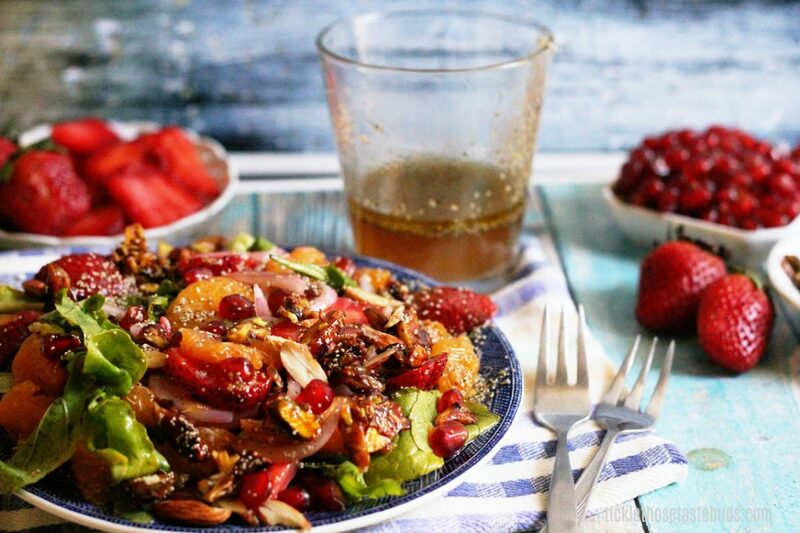 Plus, it's healthy and what mom doesn't love that?! That is such a cute and fun idea. I love rice and basmati is one of my top favorites. My daughter love Olaf from frozen and this is so adorable. I know she would really love it. 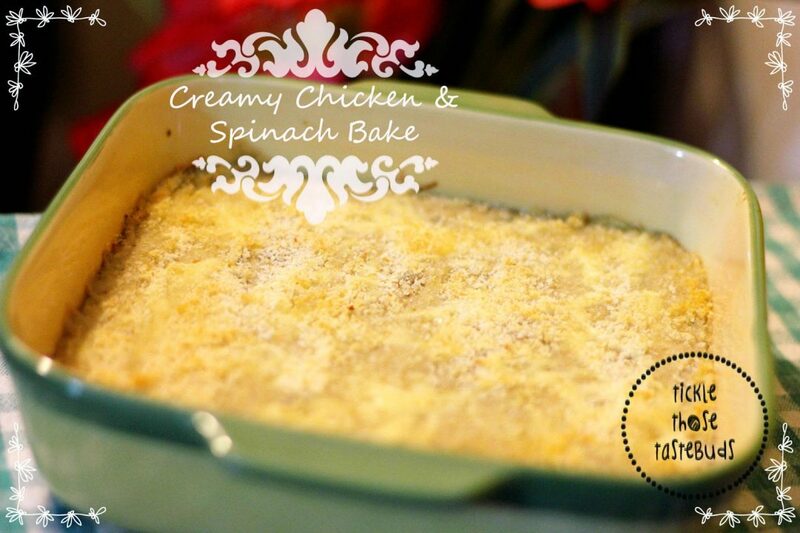 This would be something amazing to make my kids for lunch. I think they would love to see it in their lunchboxes. I am going to have to try this one out. Thank you 🙂 Hope he enjoys this.